It has been awhile since a wedding planning post, but don't let that deceive you - we have been hard at work at invitations, centerpieces, booking vendors and all of that fun stuff, but I haven't wanted to document too much ahead of the wedding. Partly superstitious and partly not to ruin the surprises for our guests! However, since this blog makes it seem like all we have done is get our Save the Dates out, I figured it was high time to share another project. We had a few brainstorms for how to do the table numbers that included painted wooden numbers, etched on the lanterns we are using for centerpieces or even put inside the lanterns themselves. Bob found our method walking the aisles of Walmart of all places! He picked up this set of mini canvas and easels for us to consider. A few weeks later we found ourselves at Blick throwing more than a dozen into the basket! You can see the originals in this shot from my craft shelf post. We ended up going a little larger canvas than the Walmart versions to help them stand out on the tables. The canvases are about 3 1/2" tall and the easels help them stand about 5" off the table. The next step was figuring out how we would make the numbers themselves. After considering painting or stenciling on, we decided on using the map pages that we are going to try to pepper throughout the reception. I love the idea of a travel theme without being so overt that there are globes everywhere and tables are named for countries (not that there's anything wrong with that!). Enter an old atlas picked up at a second hand book store for $7. I am picturing a few paper flowers, backgrounds for the programs, etc. Using the same font we landed on for our invitations - Peignot - I created number stencils. Eureka moment came after printing page 1 - I could save a lot of ink by just printing them as an outline and not filled in with black. Funny tidbit about the font. The Wikipedia definition shares different media that have used this font and one example is "the first three seasons of The Jerry Springer Show." So we're in good company. More on the font when I post about our invitation design process! Each page in this atlas features a state, country or general area of the world. We picked out a dozen or so pages that had special meaning to us: cities we have been to, countries we have explored, our hometowns and so on. I outlined the numbers over the preferred area and used scissors and an xacto knife to make a clean little number. After a little bit of work we had highlighted cities like Chicago, Denver, Boulder and Crivitz (places we have called home); Cairo, San Diego, New Orleans, Rome and Florence (places we have traveled together) and Belize (our honeymoon destination!). Until we know exactly how many tables we will need - dependent on those r.s.v.p. cards - I didn't want to overdo the work at this stage so only created numbers 1-10 for now. I did make stencils for up to 14 which is our high number for table possibilities. One might think, "why make other stencils, all the digits are fall between 1-9?" I realized that two of the numbers together were too large for the canvas so I needed to downsize the double digits just a tad.Once the numbers were done, it was time to tackle the little canvases. Sticking with our color scheme of metallic gray, mustard yellow and navy blue, we painted the canvas a silvery gray and added navy and mustard stripes that echo our invitations. A little bid of Mod Podge and the numbers were affixed. The only thing left to try out is painting the easel itself. Likely a navy blue. 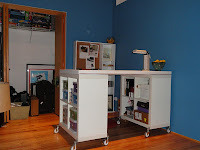 We are planning on having white tablecoths with silvery gray runners, so hopefully the navy blue will help it stand out. I painted all 15 of the canvases we have so it should be pretty quick to add a few more table numbers as needed. However, I can also see a few other uses for the extras: letting people know to sign the guestbook or maybe sharing the cake flavors. . .
Cross another project off the (rather large) list!